Companies need to upgrade their business systems and take advantage of the latest technology. The problem is that companies have invested millions of dollars in ERP and other legacy systems, many of which are contributing value to the organization, so it doesn’t make sense to disrupt their business with a major “rip and replace” effort. The solution is a dual platform strategy that embraces and enhances current system, while tying all systems together and supplementing them with the powerful new functionality that is available today, such as real time visibility, intelligent agent technology, and blockchain. 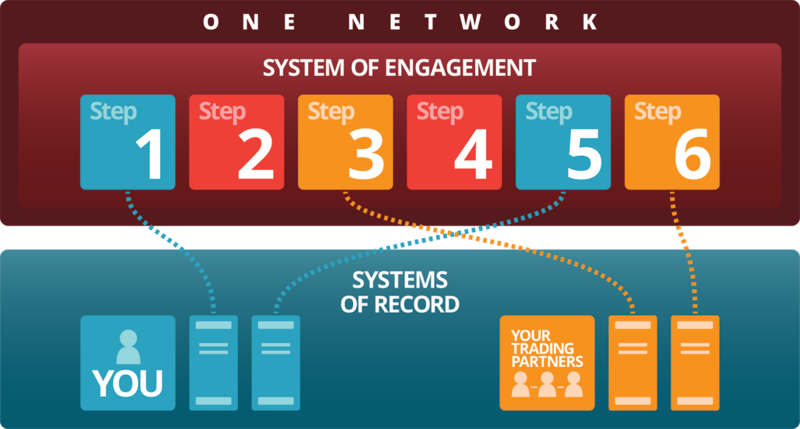 One Network’s Real Time Value Network (RTVN) embraces legacy systems (your own and your trading partners), and incorporates the data and processes into the network, giving you control over how complex multiparty processes are managed across companies and systems. This means that companies can fully recoup their investments in ERP and legacy systems, while enhancing business processes with the RTVN. And all without a high risk, low value “big bang” implementation. The multi-party dual platform strategy involves a phased approach to migrating legacy applications into a unified Platform. The RTVN’s Tunable System of Control provides an easy visual interface that coordinates and delegates full processes (or individual steps in processes) to the appropriate system of record. The multi-party transactional platform is introduced as an orchestration and visibility layer between systems. Thanks to its extensive system integration capabilities and flexible data model, the Platform can act as an ESB (Enterprise Service Bus) to connect existing apps. But beyond the capability of typical ESB’s, the platform also stores the data that flows through in its own extensible semantic model. This provides visibility, alerting and other analytics across those legacy systems as part of the first step of the “embrace” approach. The platform begins subsuming legacy systems using a combination of its existing commercial modules, along with customization models developed and deployed using the SDK. The platform has an extensive set of commercial modules covering many business domains, including order management, transportation, warehouse management, and financials. Using these as a foundation, additional modules can be developed using the SDK to fill functional gaps unique to legacy systems. Once these modules are developed, they can then be deployed on the platform. Modules running on the platform have the advantages of a shared data model, shared functional capabilities, modern technology, and more versus their legacy origins. The Tunable System of Control on the RTVN allows you to easily delegate the system of record for a process. Once the functionality is enabled on the network, a simple UI enables you to switch the functionality to the network app, disengaging the legacy app from the process. The changeover really is “push button” simple and seamless. This makes it very easy to phase in the migration of these systems onto the platform (or even parts of those systems), as parts of the platform’s business flows can be declaratively enabled/disabled through visual tools and delegated to other systems. That’s it. With the Real Time Value Network and the Tunable System of Control, you don’t need to choose between legacy or the latest technology; you can use both. You can enjoy a rapid and seamless transition to a digital platform, while remaining in full control of existing systems and extracting value.